Put graham crackers in a food processor or plastic Ziploc bag and beat until they are finely crushed. Mix butter, powdered sugar, peanut butter, and graham crackers together in large bowl. Roll into 1" balls. Place rolled balls on large cookie sheet (I lined my cookie sheet with parchment paper) and stick in the freezer for about 20 minutes. In the meantime, melt dipping chocolate. Once the peanut butter balls have set up, dip in chocolate and place back on cookie sheet. Let set up before serving/sharing with neighbors (but you can pop a few in your mouth just to test them and make sure they are safe to eat- it's a chance that I am always willing to take). You can also make these look like a Reese's peanut butter cup- purchase mini-cupcake holders or candy paper cups on a large tray. 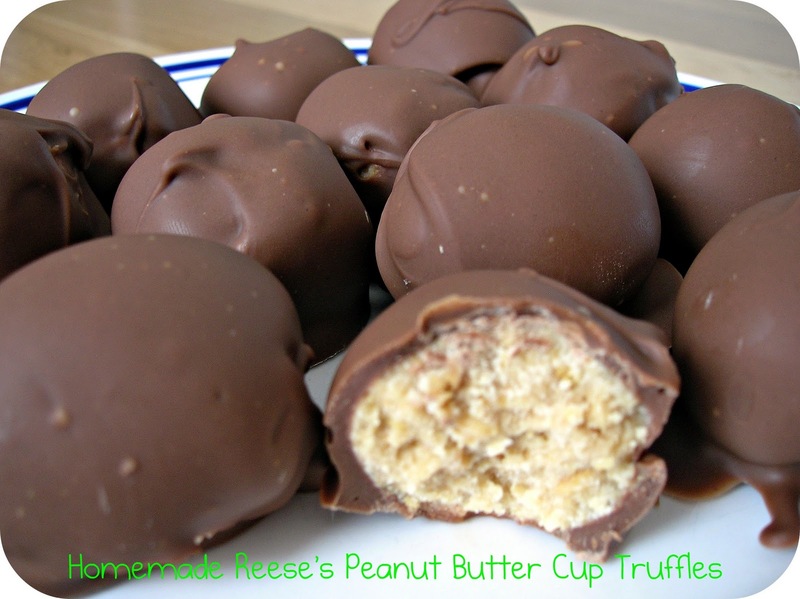 Pour a small spoonful of chocolate in the bottom of each cup, add a flattened peanut butter ball in the middle, then pour a little more chocolate on top to cover it up. Oh me. I am in love. Thanks for sharing! PS. Love the new header! Where do you find gluten-free graham crackers?! I've been wishing they existed. Also, does anyone know how many cups of crumbs these 10-12 graham cracker sheets make? Thanks. I would look on the internet if you have not had luck at your local grocery store down the gluten free aisle. 14 graham crackers crushed equals about 1 cup of crumbs. You can make this without the graham cracker and they are to die for! I crush peanuts and drizzle over the dipped chocolates. They also freeze well too. What a great recipe! Can't wait to try it. Love your posts! Oh good grief...my jeans will NEVER forgive me!!!! I had to catch my breath for this one!! My favorite- these are deadly delicious, you temptresses you!! I have also been lucky enough to have been on the receiving end of these amazing little treats from Summer. Wow! They are so good. Can't wait to try the recipe. Yummy looking recipe... Donna Hay has something simmilar in a slice. I wonder what I could use instead of graham crackers. We don't have those in Australia. Digestive biscuits would be pretty similar, do you have those? P.S. I LOVE your new headder!!! It's awesome. Did you have someone do the graphics for you? Yum! These look awesome! Linked to you from Friday Favorites! OH, I have to make these! Thanks for sharing. Am I reading this right ... 1 POUND of powdered sugar? Hi Kassie! Yes, it is a pound of powdered sugar! It makes seriously a TON of truffles (6 to 7 dozen! ), so if you wanted to half this recipe, you totally could! SO super yummy and we made them gluten free! Now i know what my children are gettting when i load them up with sugar! Graham crackers in my area come in a sheet of two graham crackers. Do you mean a 10-12 whole sheets of two? Please clarify exactly what "dipping chocolate" is for those of us who are not experienced candy makers. They do look delis! These are fantastic! Just made them to take to Easter dinner tomorrow. Dipped half in milk chocolate, half in white chocolate. I know they'll be a HIT!!! I also made these and they were great! I did the half dark cocoa and half white chocolate (Wilton's melts work great! )as teacher's gifts at the end of the school year! I gave my mom a few extra and needless to say, I am making these for our 4th of July party since my mom loved them so much! These look fantastic! Quick question...if you don't eat the entire batch in one sitting (!!! ), do they need to be kept in the refrigerator? Thanks so much for this, and all your amazing recipes! Saw this on pinterest...this is a similar recipe to what I make every year for Christmas and they are delicious...even better dipped in white chocolate. I always make some of each :) God Bless! this looks very good.. My family actually does this recipe, but we call it Chocolate Balls and do it during Christmas time. Some put coconut in it (my family altered the recipe for my distaste for coconut). I've been making these for years. Seriously one of the best recipes ever. I'd like to share this recipe on my blog, with a link back to this post. I'll send you the link when it's up. Can't wait to make these! Thank you! Just made these...the texture is really close to a Reese's, but I had to add salt (well to be fair I did use unsalted butter to begin) to get it to the right saltiness to combat the super sweetness. I didn't really keep track of how much I used, I added 1/2 tsp at a time until it tasted right to me. I'm a big fan of the salty sweet combo though. I might try using pretzels instead of graham crackers next time to get that extra saltiness in there. Great recipe! Can anyone tell me what a lb of powdered sugar is in cups? Also is powdered sugar the same thing as icing sugar? Thanks! Looks yummy! The very first original recipe of this is used with rice krispies instead of grahm crackers..tastes way better too. Just finished making these, so easy and yummy!!! I put them in the freezer! hi! I Can you please let me know if they can be kept for a few days outside the refrigerator? I made these for my husband, for fathers day, and they are so, so good. but I just noticed while I was reading through your comments, that I only used 1 cup of powdered sugar instead of 1 pound. they had to stay in the fridge,or they got to soft.I'm just glad my mistake was so good. Now I will have to try the real recipe. Delicious! Thanks for posting the recipe. My family were eating these as soon as the chocolate was set enough to touch, good thing the recipe makes so many! Made these tonight and did not have enough dipping chocolate so I have about 2 dozen naked peanut butter balls left over. Also....making these in the summer is kind of tough. It's hot out. I left them in the freezer for 20 min....pulled them out and they were close to frozen but not. By the time I got the first few dipped the others were getting mushy. The mushier they got the harder they were to dip. They would fall apart in my hands while dipping. (so I ate those ones!) I used a tooth pick to spear and dip them but as they warmed in the heat of the summertime soon the toothpicks were even ripping them in half. They taste good....but they are pretty messy to make and due to them being so sloppy they aren't as attractive to look at as I would want them to be to present at a party or get together. Since I prefer no bake receipies to be easy....and these were so messy they became difficult, I probably wont be making these again. One thing that works well is using a plastic fork and just leaving the outside tines of the fork. Break off the inside ones. Then use that to dish the truffle out of the chocolate and let it drip off. Then set it on the waxed paper or pan to set up. 1 pound of powdered sugar equals about 3 1/2 cups. Hi! If I want to make these for Christmas how far in advance can I make them that they'll keep? Thanks! Got this recipe from a friend's (Pam Fischl) mother . Their recipe uses half chocolate chips and half butterscotch chips for melting. I changed it to a 3:1 ratio (more chocolate) but that butterscotch kick really makes it special. Has anyone tried this with cinnamon graham crackers? These are very similar to the recipe I have from Pillsbury cookie book I have from 1982, they use a can of Ready to Spread Vanilla Frosting instead of the confectionary sugar, and 2 cups of graham crackers. I was using this recipe for years but I think they are a little too sweet for me as I get older. And instead of using the chocolate bark they use the Chocolate Fudge Frosting (for those who don't have access to the bark in their country). They are good, but I want to give this a try, mainly because you have all the right ingredients, (don't want to use Cream Cheese, son won't eat them if I use) for me anyway. I love your idea about the plastic fork, breaking the ones inside, I will definitely use this technique. You taught this old lady a few new tricks tonight, thanks. Thank you again girls, by the way, you all look like you could be sets of twins, are you? Well got to get baking..
Can anyone tell me the conversion of the graham crackers, how many cups of graham cracker crumbs as I already bought two boxes. Got the powdered sugar, thank you ladies for that question. I am making these today, can't wait. Hi Gloria. This recipe calls for about 10-12 whole sheets of graham crackers. Which is about one whole sleeve. Some brands package their graham crackers in half sheets. So if they are just the square ones, you will need about 20-24 halves.